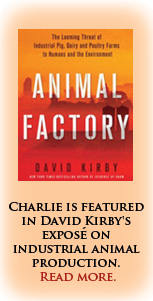 Animal Factory chronicles many of the real threats of industrial animal production to humans and the environment through the experiences of typical, rural American families. The story of several Clean Water Act prosecutions, with Charlie as the trial lawyer, is featured in the chapters devoted to Helen Reddout's real-life nightmare. Horrendous odors, midnight orders to pump manure lagoons into local waterways, chased by dairymen, agency inspectors threatened - this story has all the elements of a John Grisham novel - the difference being that this story is true. .
“Essentially, the defendant thumbed his nose at DOE all these years and he got away with it,” Charlie said, promising to walk the judge through the litany of violations, fines, summonses and angry letters involving Bosma, dating back to the legal statute of limitations. When it came time for witnesses, Charlie called Harold Porath, a former DOE inspector who was now an expert for Bosma, to the stand. He testified that runoff from a Bosma sprayfield was reaching [irrigation canal] ditch 26.6 and, from there, the Yakima River. Porath later tried to suggest that some wild birds he saw near Drain 26.6 [irrigation canal] might explain the elevated E. coli levels in the water. Charlie grilled him about how many waterfowl, exactly, he had observed on the day he made his inspection. “Two, three,” Porath said flatly. “And they were flying where? Overhead?” Charlie inquired. On June 16, both sides presented their closing arguments. The courtroom fell so silent you could hear someone’s watch ticking. The judge stared in bemusement, possibly thinking the same thing that Helen did: “Did Charlie Tebbutt, Esq., just say what I thought he said? In federal court! ?” But after that, during the penalty phase [the next phase of trial], every time Bosma’s attorneys raised the bird defense, Judge Shea told them not to mention it again because that argument just wasn’t going to fly. 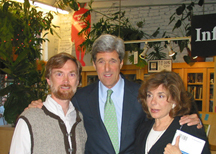 Charlie with John Kerry and Teresa Heinz Kerry on This Moment on Earth booktour. Site design by Charlie Tebbutt and Painted Mountain Design.